After Kelsale, we motored north to check out another NGS candidate at Wenhaston Grange. Stunning vistas, walkways, even a harpist. Everything but a wall, as I remarked to a chap who turned out to be the gardener who'd been working flat out on it for the last three years. Funny, he said, but I'm hoping to persuade some clients to build a new wall at Huntingfield. And did I know about the crinkle-crankle wall at Orford, open tomorrow, Bank Holiday Monday? We shipped up at St Bart's on a grimly breezy late afternoon to grab the Orford Open Gardens leaflet. Last on the list was number 10, The Old Rectory. Along High St, cut up Doctor's Lane and here's Rectory Road. 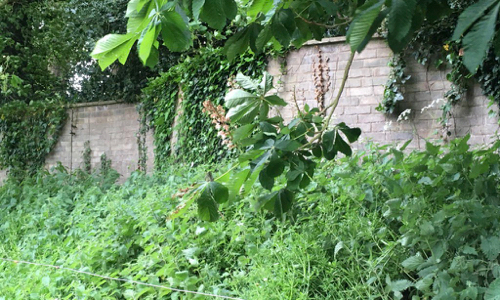 That ivy-covered structure would appear to be the wall in question. 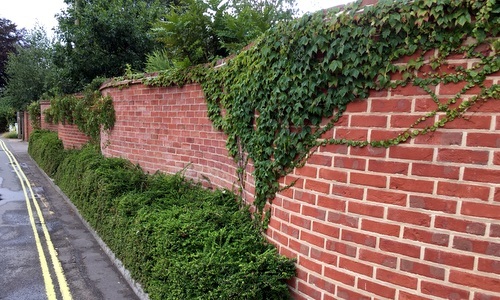 Informative chat with Tim & Elizabeth Fargher revealed that after the previous non-serpentine wall blew down, they asked for quotes from R&J Hogg of Coney Weston. Least expensive was a plain old wall. Second cheapest was a crinkle-crankle, which they chose and then opted for it to follow the slope of the road along its length. That was 1990, and it's still standing strong. Double the height of Shotley and a good deal older too, it leads the eye to the wonderfully named Fig Tree Cottage (sold, subject to contract, for £269,950). Lazing there on a sunny afternoon, it snakes underneath some pleasingly pointy coping stones alongside the garden. Not going to change the world but perfectly pleasant. Out for a countryside stroll, my mother-in-law eyed a wall. To help walk off the Sunday roast lamb and pavlova, we all set off from Onehouse. Two miles later and we were in Harleston along Moorbridge Lane. Over there, said MIL. I was snapping away from all angles when a lady shouted out, "Do you like our wall?" My husband built that about five years ago, she said. We saw the one at Great Waldingfield, took some measurements of the one at Eye to get a feel for the curves, then chalked an outline back home. It's all made with reclaimed bricks, too. Splendid gateway, too. Their house is called Pulcherrima, by the way, meaning "most beautiful" in Latin. You know, like the poinsettia? Should also mention a second low-level hand-made crinkle-crankle on the other side of the house. Ain't it clever what people can turn their hands to? 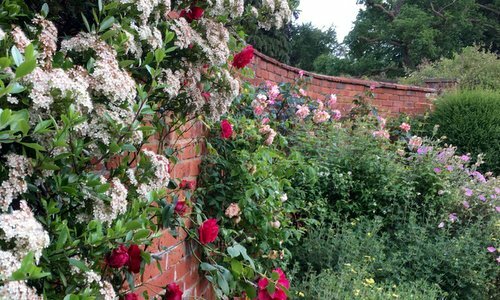 Credit to my mum for stumbling across a web page stating "an old crinkle-crankle wall runs round the kitchen garden". This was for Melton Hall, a listed building just outside Woodbrdige with a "curved portico on Roman Doric columns". Colin, who's lived there for 20 years with his family, was most accommodating and invited us for a visit. To the rear is an enchanting and well-tended kitchen garden, three walls of which are wavy and perhaps contemporary with the current 1807 house. There's talk of the walls having been built by Napoleonic prisoners. However, one or two names engraved in the brickwork, such as "George Newington" and "Vermas H.N. ", seem to indicate less exotic origins. You'd run out of fingers counting the variety of roses on display. 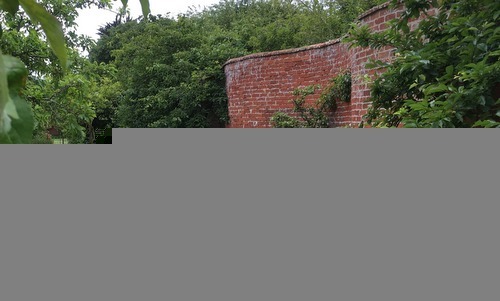 Beyond the walled garden lies a wildflower meadow, a patch of woodland and a croquet area with freshly painted lines. All rather lovely. Cheers, Colin! Super-helpful Dr Ken gave us the full tour with mentions of the original structure, sandy soil conditions, seeing the wall at Orford being constructed first-hand and even links between Cedar Court and Rendlesham. 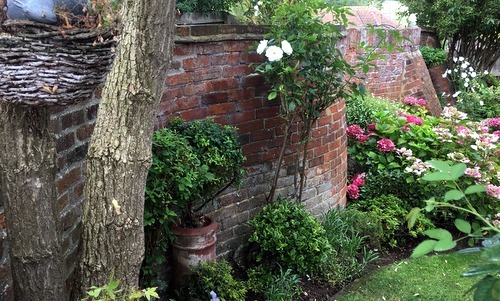 Lovely garden, nice cup of tea and quite a wall. Thanks, Dr Ken! 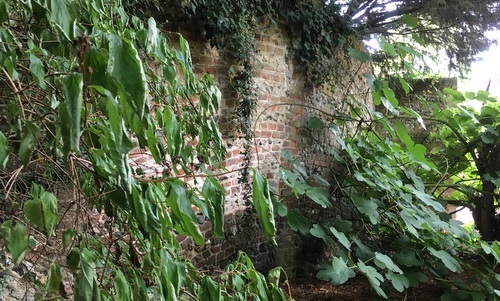 On the to-do list forever have been the Grade II listed "Serpentine walls surrounding kitchen garden immediately to the north west of Coney Weston Hall". My Mum wrote a speculative letter to the address and got a phone call a few weeks later. Come along any time you like, said the owner, Colin (no relation to Colin at Melton). That was early 2016, and subsequent attempts to make contact got nowhere. I suggested that we drive out there one Saturday afternoon and play it by ear. Fortunately Colin was at home and buzzed us through. He's always lived in the village, he explained, and it had always been a dream to buy the big hall. He sold his business, the property came on the market, and now it's his, all several thousand acres of it, including, I believe, the old RAF Knetishall. Hence the American flags flying by the gates. After hearing a few cracking tales of WWII memorabilia found on the land, Colin left us to wander around. 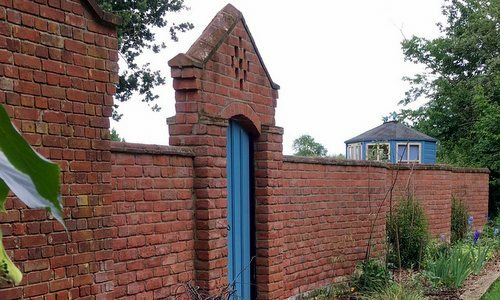 He has big plans for the house and land but, as he admits, that walled garden is currently in bad need of some TLC. Think weeds and nettles. First I'd heard about crinkle-crankle walls being prone to a particular type of bee. Lots of tiny holes to be seen. Wall features a squared-off gateway, too, on the southern side. Perhaps we can go back as and when it's been tidied up? Regardless, big thanks to Coney Colin. 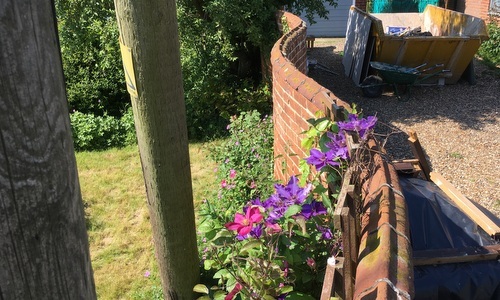 The rear garden is a safe enclosed space sheltered by a lovely old Suffolk crinkle crankle wall. Mum did the groundwork again, managing to get in touch with the owner via the agent. Sunday, 3pm? Yes, please. Lunch at Earsham Street Cafe first, obviously, just up the road from the St Mary's wall, then the two minute walk through to Broad Street. Here's Mrs Duckett to let us in, completely unfazed by the sight of five of the crinkle-crankle crew. Through to the lovely garden to admire the lovely wonkily buttressed wall, neighboured by flowers and pots and bushes galore, and ideal for an aspect of the magnficient Georgian rear of the house. Then, unexpectedly, the full tour of all three floors filled with period doorways, stairs and art everywhere. What a place, with sitting rooms on every level, each with a fab view. Mrs Duckett won us all over and very nearly adopted Eldest. Delightful wall stroke house stroke owner. Where did we head after exiting Oxnead? Back to Earsham St Cafe, naturally, for tea and cake round the back in the sun, trying to find out the secret ingredient in their flapjack. Waitress wasn't saying. Left out of the cafe, left again, pause to stroke the cat on the wall and along the path to take in the impressive castle remains. Round by Jesters, now closed, and G. points to our right and says that it's always good to see that crinkle-crankle wall again. Which is odd, 'cos that wall over there is completely new to me. We've stumbled across a new wall! This modern wavy wall surrounds somewhere called Castle Orchard House. Google tells us that this is the work of Willow Builders of Ditchingham, just over the border in N*rfolk. They got brought in to extend the house, landscape the grounds and form, as their website says, "a crinckle cranckle walled garden". Shocking spelling. Nice wall. Seen from the driveway, The Croft itself is an impressive C17 timber-framed residence. Taking a chance, I knocked on the door, did my lunatic spiel and was shortly joined outside by the extremely cordial owner man whose name I instantly forgot. Apologies, Mr Croft. Bulk of the wall is mostly obscured by trees and ivy making it hard to make out the actual crinkles and crankles. Oddly, the surface is largely covered with curvy patterns of flink and brick -- not seen this before -- and there are one or two supports. Small arched doorway, too, plus that "carriage entrance". Section adjoining the house now guards a modern shower-room, apparently. 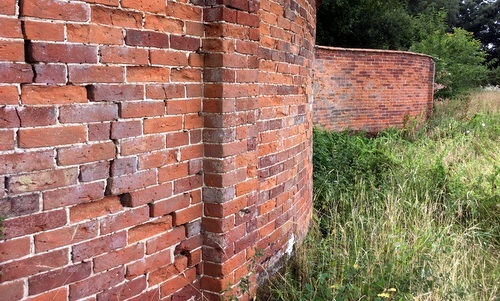 A very enthusiastic and helpful Mr Croft talked about the apparent mathematical symbolism of such walls, and the possible link between his wall and an acolyte of one Capability Brown (Heveningham still to do). Cheers, Mr Croft!